I'm a country girl. I'm used to driving everywhere to reach most of my destinations. If I ever considered calling a taxi to pick me up, I'd a) have difficulty finding a company to drive out that far and b) have to pay a ridiculous amount of fare for the total number of miles traveled. 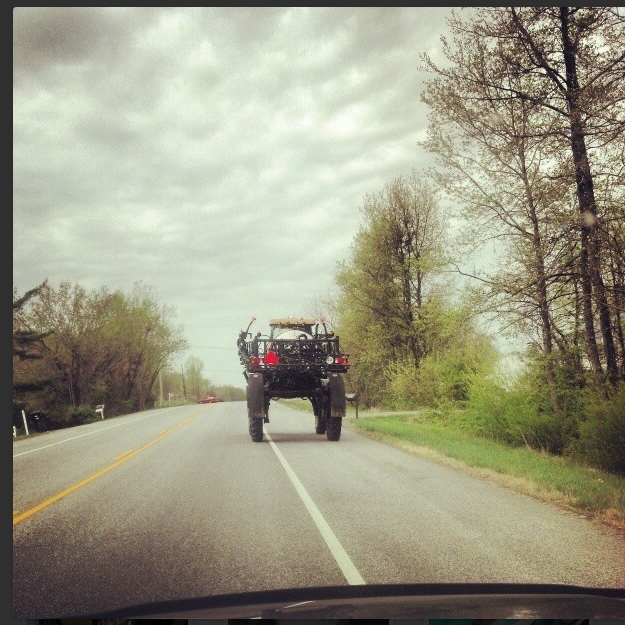 I guess I better hitch a ride on one of the tractors I share the road with on a daily basis. A couple of weeks ago, I headed to Washington, D.C. for an event. Whenever I head to the nation's capital, I employ the help of public transportation such as the Metro. I like to avoid traffic at all costs and riding gives me the opportunity to take a break from all the driving I do during the week. Once I am in the district, I can walk to most of my destinations, as city dwellers typically do. This particular event took place in Georgetown where, unfortunately, there is not a Metro train stop. Instead, I had to take the train to the nearest train stop and catch a ride to my final destination. This is where Uber comes into play. Uber is a technology company that has developed a software that allows anyone to request a ride via mobile app, text message, or the web. Drivers arrive curbside in just minutes, you can track the arrival of your ride, you'll receive a text message when your driver arrives, the credit card on file is charged after your ride, and you will receive an email receipt detailing your trip. Before heading to D.C., I downloaded the app on my phone (iPhone, Android, Blackberry) and signed up for the services by typing in the requested information. I had also found a promotional code on Twitter from a local blogger that gave me money off of my first ride. Score! I entered that code and my account was automatically credited. Once I arrived in D.C. and got off of the Metro train nearest Georgetown, I whipped out my phone. Using the app, I was able to pinpoint my exact location on a map. Based upon this information, I was able to send the details of where I was so that a driver could pick me up. I was immediately sent a message letting me know that my driver was on the way and how long it would be until he arrived. I waited no longer than 5 minutes. My driver arrived in a black sedan. His name was Rajan. I opened the door and noticed right away the cleanliness of the car. It was refreshing to get into an air-conditioned ride and have a little chill time right before my event. I had a bit of small talk with my driver. I explained to him how this was my first time using Uber's services. He was nice enough to tell me all about it and even showed me the device in the front of the car and exactly how it worked. He was great. I arrived at my destination. I was let out on the curb and my account was charged as soon as the trip ended. A receipt was sent to my email address. I was also given the opportunity to rate my driver. This is very important. Make sure you leave honest feedback about the driver. This helps the company make improvements on their services and lets them know if their employees are meeting the expectations of the consumer. Overall, Uber is a great service to use. The app was user-friendly and effective when I used it. It comes in handy when you are pressed for time or you want to ride in style. No need to jump up and down to hail a taxi for several minutes. Uber is uber! The only con to the service would be the price. As you see above, I traveled less than one mile, but I was charges $15 after everything was totaled. It was based more on the time of the trip. Granted I did not pay for this particular trip, but if I had to I would have been a little more reluctant. I guess the convenience alone is worth the price. 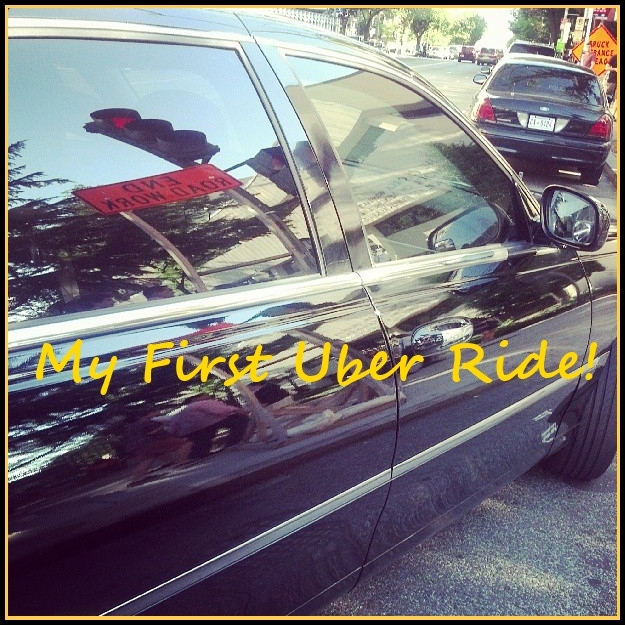 Luckily, UberBLACK ( a sedan), has a reduced fare of $12 minimum from the usual $15. There is a lot more information to learn on the Uber site. Be sure to visit Uber.com for more details. Wait! 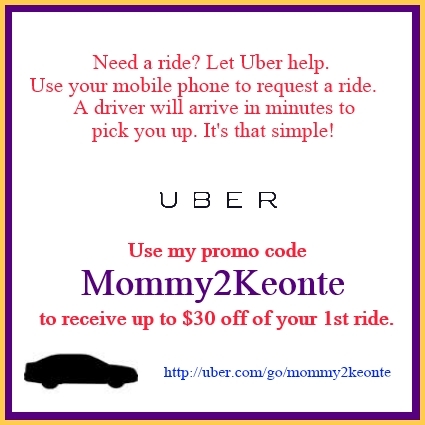 Use my promo code below to receive up to $30 off of your first Uber ride. Ends 7/31/13. There was no monetary compensation for writing this post. 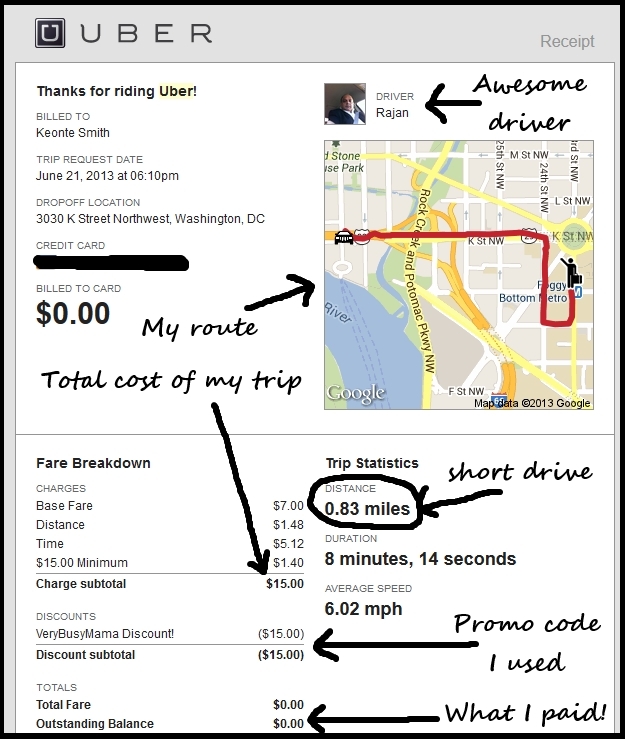 Uber was nice enough to create this code to offer to my readers.